In 1984, the oil, chemical and atomic workers began a 5-year campaign to win back the jobs of its members locked out by the BASF Corp. in Geismar, Louisiana. The multiscale campaign involved coalitions with local environmentalists as well as international solidarity from environmental and religious organizations. The local coalition which helped break the lockout was maintained and expanded in the 1990s. This alliance is one of numerous labor-community coalitions to emerge increasingly over the past 20 years. 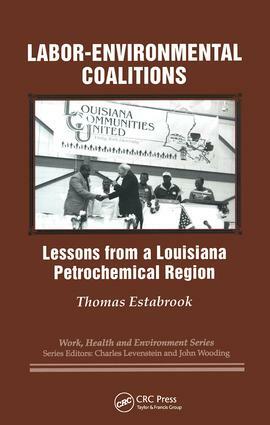 ""Labor-Environmental Coalitions: Lessons from a Louisiana Petrochemical Region"" traces the development of the Louisiana Labor-Neighbor Project from 1985 to the present, within the context of a long history of divisions between labor and community in the U.S. The Project continued after the lockout, thriving during 1990s, expanding from one community to four counties to include 20 local member organizations, and broadening its agenda from the original jobs crisis and pollution problems to address a wide range of worker, environmental health, and economic justice issues."" Labor-Environmental Coalitions"" explores the dynamics of the Louisiana coalition to offer lessons for other coalition efforts. The book seeks to understand coalitions as a necessary strategy to counteract the dominant forces of capitalist development. The author contends that the Labor-Neighbor Project, like labor-community coalitions generally, created a unique blend of politics shaped by the geographic nature industry's politics; by the relative openness of government; and by the class experience of labor and community members.The Louisiana Project demonstrates that for labor-community coalitions to thrive they must broaden their agenda, strengthen their leadership and coalition-building skills, and develop access to multiscale resources. The author argues that for labor-community coalitions to have longer term political impact, they should adopt an explicitly progressive approach by building a broader class and cultural leadership, and by demanding state and corporate accountability on economic, public health, and environmental justice issues.